This weekend was homecoming at EIU. As usual we camped at Fox Ridge State Park and drove the RV into town for tailgating. We did get to see a very small portion of the homecoming parade as they blocked the main street through town. They did a nice job of balancing the parade and traffic. They took turns blocking traffic for a section of the parade then they would block the parade so traffic could move. This is one of the local high school bands. Tailgating! It gets better every game! More and more of Trevor's and Kevin's friends are coming to tailgate with us. The EIU marching band has been marching through the parking lot before the games this year. The Blue/Gray Man came to this game! The students were really into this game and made a good showing! Trevor again was given a clip board to chart the defense. Notice the pencil behind the ear. Again, this was a frustrating game. We did win but only by three. This is a team that we should have at least doubled up on. They just got by Indiana State, a team we beat earlier by 38 to 3. Again, it seemed like we had no fire for most of the game. There were times that we played hard and looked good, but most of the time it looked like we were doing just enough to get by. That's not going to work when they play the good teams. One explanation that I heard that might have some validity is that EIU plays better against the teams that use the "spread offense." I hope this is true because that is the offense that most of the remaining teams play. Sunday morning the guys came out for breakfast. They brought Rambo with them. Rambo is a pit bull that they rescued when a student left school and left the dog behind. Rambo is one of the best behaved dogs I have ever been around. Hopefully the boys can find a good home for him. Trevor's leg was reevaluated before this game. He had hoped to start playing this weekend, but was told it would be at least two more weeks. Since he won't be playing and Cindy is getting low on vacation time we will forgo travailing to the Eastern Kentucky next weekend. After EKU there are two more home games and two more away games. The last game of the season is in Cookeville TN. and is the weekend before Thanksgiving. 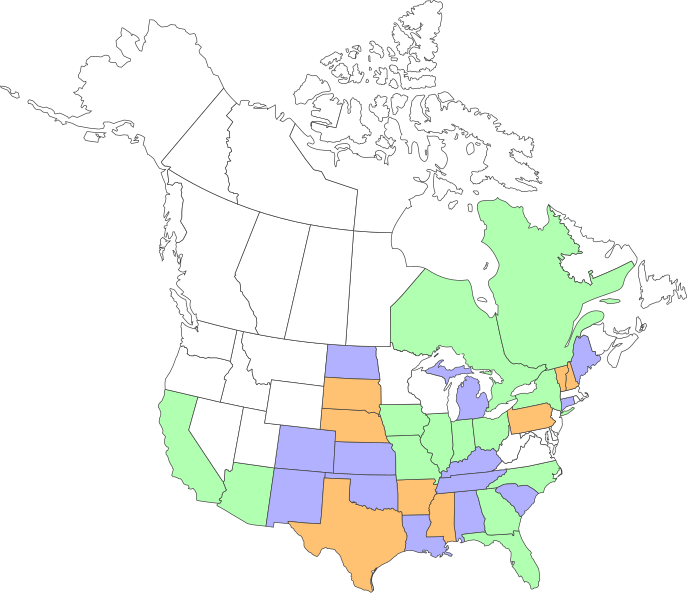 By saving Cindy's vacation time we might be able to use that whole week to take our time traveling back through Tennessee and Kentucky, before meeting the boys for Thankgiving. Maybe? The weekend of Kyle's birthday we parked at Beaver Dam State Park. We had decided that I would go down on Thursday so we could get a good spot. NOT! When I got there the campground was almost full! The site I took was OK but the ground fell away rather quickly creating a slope for the table and fire ring. Also, we were right on the road. This only added to an unpleasant start to our weekend. I unhooked the jeep in the boat parking area as I knew there was little room in the campground to unhook. When I got in the jeep to start it it was totally dead, not a click, nothing. Kyle and I got a jump from the ranger and drove the jeep for several miles to recharge the battery. I was making plans to get new battery in the morning as the battery in the jeep is four years old. Friday morning an RV in a spot next to us pulled out leaving a larger flatter site vacant. I was by myself which meant that I had no spotter when I was backing up. And when I looked at the site there were trees that I would need to get between and a tree at the front that I would have to maneuver around. But because the site was next to the one I was in I would not have to pack anything, I could just drag it to the new site. Well I made it! Before I moved, I checked the space I needed to use to get in the site and planned the turns in my head. Even with that I had to stop and get out and check clearance every few feet as I backed up to make sure I was clearing the trees. Now for the battery. I had drove Kyle's SUV to the campground after dropping him off at his place the night before leaving the jeep there. Kyle's apartment is within easy walking distance of his office, grocery store, and the town square, so he did not need a vehicle. On my way in I checked prices at the local Walmart and parts stores. But when I got to Kyle's apartment, the jeep started without a problem. A few days later I figured out what the problem was. The supplemental barke in the jeep had blown a fuse and when I finally got one in Charleston and put it in the bake system the brake unit would not stop running. It probably ran most of the trip to Kyle's thereby running the battery down before blowing the fuse. After I got back to Quincy I called Blue Ox and they sent me a replacement unit and I sent them the old one. All this episode cost was a little worry and $13.00 to ship the old unit to Blue Ox. Good customer service! Friday evening, after Cindy and Trevor arrived, we ate in town. But Saturday night we ate at the RV and tried out the new TV stand and converter box. Of course we watched football! Trevor spent the nights with Kyle at his apartment so Kyle could show him around town. Sunday morning the guys came out for breakfast. Later Cindy returned to Quincy for the company picnic and the boys and I watched football the rest of the day. Then Monday morning Trevor and I went to St Louis to see a doctor. The appointment went well and we got back to the RV just after lunch. That left enough time for me to pack up and relocate across the state at Fox Ridge State Park. I like the way Fox Ridge has there campsites set up. There are plenty of tree and undergrowth to provide privacy. But most of the campsite are plenty big once you are in them. I spent Monday and Tuesday night here while Trevor attended classes. Lately I have not been feeling well so the two days here were a welcome down time. Wednesday, just after lunch, Trevor, Pug and I headed out for Fort Massac State Park. Trevor is not playing because of his leg and Pug is not playing because he had surgery to fix a broken finger. When we got to Fort Massac it was full! On a Wednesdaynight! No-way! The campground host told us about a commercial campground across the river in Paducah. So we parked in the sun on the gravel lot. A big difference from parking amongst the trees and grass of the state park! Thursday morning before we left for the game we visited Metropolis IL. Metropolis is the home of Superman! Trevor looks more like Superman than I do! Trevor had trouble fitting behind the photo stand. Pug is a bit smaller and was able to get the pose. I was rather disappointed with the Superman statue. After seeing the Jolly Green Giant and the world's largest pecan, Superman is not super. But the pig VW was worth seeing! No it's Big John! This statue was the same size as Superman so maybe it is Superman trying to earn a few extra bucks after he is done at the Daily Planet. While there we had time to stop at the fort that the state park is built around. Fort was first built in 1757 during the French and Indian War and has been rebuilt many time over the years. In 1908 the ground around the fort was name a state park, making it the first state park in Illinois. View of the river from the block house. View from the other side of the block house. I never did confirm why the campgound was full, but in one of the flyers about the area there was a note about a weekend in October when they have a re-creation of lifestyles from the 1700's. I suspect that it was the coming weekend because of the tents and other stuctures that were setup around the fort. Tennessee Martin asked to move the game to Thursday in an effort to get a bigger crowd at the game since the next day was the start of fall break for the students. As you can see the stands are almost empty. Since Trevor and Pug were not playing, Trevor was given a clipboard to record the plays with Pug to assist him. It was not a good game for us. We did not play well on either side of the ball. We had no fire and did not deserve to win and we did not. Friday morning we were on our way back to Charleston to drop the guys off and then it was to Fox Ridge for the night. Saturday morning I was on the road heading home. We split the family this weekend with Ken heading to Charleston for the game and Kyle coming home to Quincy to be in Erin's wedding. 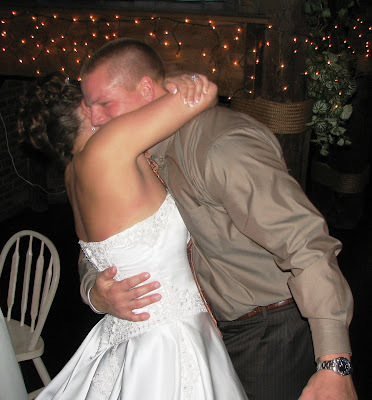 Ken has written a separate blog about the Jacksonville State game with my duties being to cover the wedding. Friday night was the rehearsal at St. Peter’s at 6pm followed by a dinner sponsored by Casey’s parent’s at the Pier. 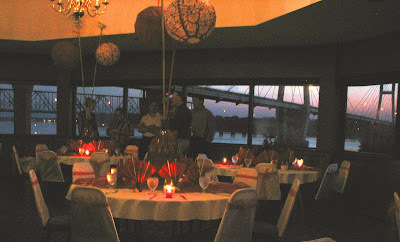 No better place for a dinner at sunset than perched above the Mississippi River. 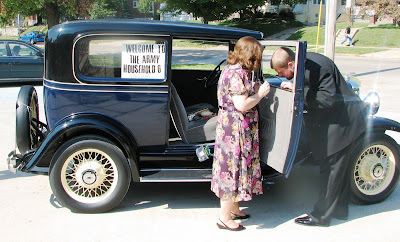 Kyle and I arrived at St. Peter’s at 1pm, an hour before the wedding and Kyle, as an usher, was immediately put to work decorating Grandpa Joe Frericks’ 1932 Chevy. It’s family tradition for the grandchildren to include this car as part of the wedding festivities. There was a slight 'oops' at this point. They had a 60 year old picture of the car as it was decorated when grandpa and grandma were married. They sat that picture against the window to use as example of how to decorate. Unfortunately the picture fell right down in to the door frame. Looks like Alan will have to take off the door panel to get it back! 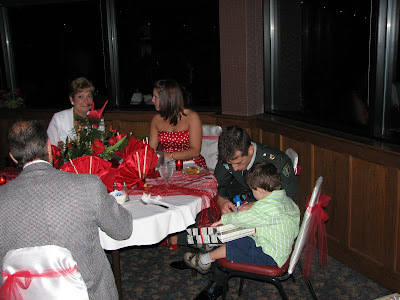 It wasn’t long before I was also enlisted to stand in at the guest book, since there apparently was some confusion with the person that was suppose to play that role. 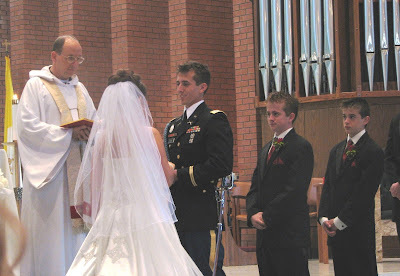 When that person did I arrive, I then had to get Kyle in because the ushers were beginning to get backed up on getting people down the aisle. It was a bit of a challenge since the back of St. Peter’s in under construction and so the ushers had difficulty bringing people from the side without getting in each other’s way going back and forth. The priest had relieved some of the tension by giving Erin a ‘hardhat’ as comic relief. As soon as the official guest book person arrived I was enlisted as the inside ‘greeter’ handing out roses and programs. The floral arrangements, the dresses, and all were absolutely gorgeous and, of course, I’m not sure there’s been a more beautiful bride! 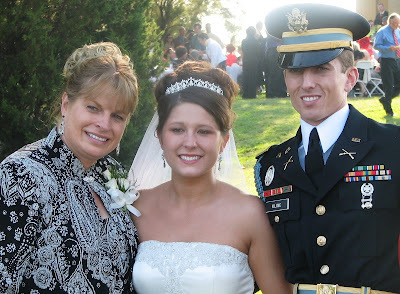 Casey also looked quite stunning in his full military dress. He’s a first lieutenant in the Army. I did my ‘official’ part as reader. It was a bit hard to look over at ‘my little baby girl’ and see her there all beautiful and grown up, smiling back at me. That country western song, ‘you can let go now’ get coming to mind and I worked hard to keep my composure. 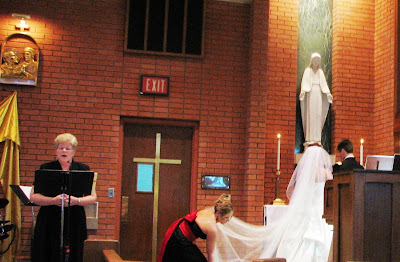 When Erin and Casey headed over to Mary’s altar, that’s when I could help but lose it a bit. The soloist performed ‘On this Day, Oh Beautiful Mother’, my own mother’s very favorite song. How quickly we go from being the generation at the altar to the generation watching our own children at the altar. 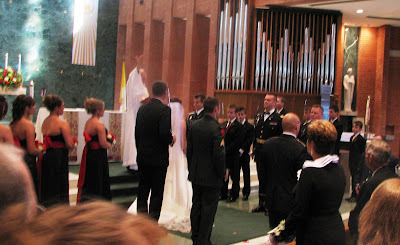 In military fashion, they had a saber line for Casey and Erin to pass under, as they left the altar. As they reached the last two soldiers, one was Casey’s close friend Baxter. He held his saber down to bar Erin’s way. He said ‘Welcome to the Army, ma’am”, the flipped the saber around and slapped her on the backside with it! I was enlisted again to hand out little sets of ‘jingle bells’ as people left the church. 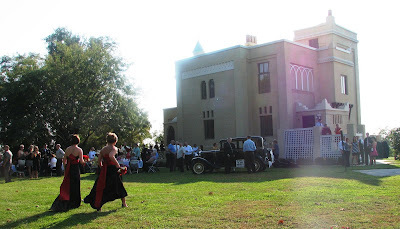 Since St. Peter’s does not allow throwing rice or bird seed, this allowed people to do something to welcome the newlyweds as they left the church. 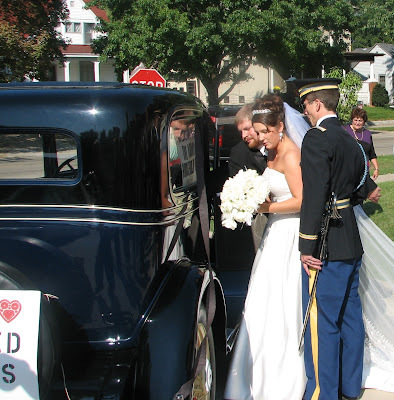 Kyle completed the last of his duties at the church, helping Cousin Erin and her new hubby into grandpa's car. From the church the next stop was the Villa Catherine for wine and cheese. I think this is a really romantic site for wedding festivities considering its legendary history. Dinner was at 6pm at Backwater’s. Backwater’s is a 3 story nightclub owned by Casey’s aunt. Needless to say, they had spent better part of a week decorating and preparing for the evening’s extravaganza and it was absolutely over-the-top! 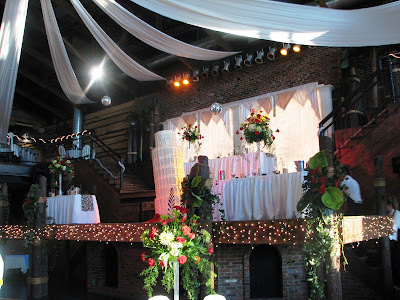 Casey had proposed to Erin under the leaning Tower of Pisa, so they had a 10 foot tall Tower as their wedding cake, which they cut with his saber. Ken and Trevor finally arrived at the reception at about 8:30. Trevor is the closest to Erin of all the cousin’s in age and in atypical bride fashion but totally typical Erin fashion she jumped him on sight, arms and legs wrapped around him. Erin has done this for years with Trev but not when he was wearing a full leg brace, and we nearly ended up with bride and cousin bowled over on the floor! There were several other memorable points in the evening. When Casey went to remove Erin’s garter, he stuck his head under her dress, and came out with a live hamster!! 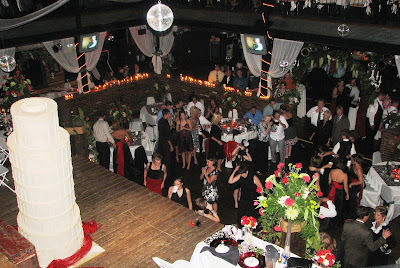 At 10:30, about the time the crowd had worn off the 6pm meal, they started playing ‘Cheeseburger in Paradise’, and the wedding party threw hundreds of McDonald’s. As usual the ‘cousins’, with Kyle and ‘Major Joe’ as the instigators, were having a great time together. I think they had toasted the happy couple with about every variation of shots and shooters that they could up with. To the point that when they did the song ‘Y-M-C-A’, cousin Melissa had to stand behind Joe and help move his arms the right direction. She said he was to far gone and needed a ‘spell checker’! Ken and I left the reception about 11:30, taking the boys car keys and both vehicles with us. Ken got a call from Trevor at 1:30 to pick him up and then another at 3:30 for the last of the cousins calling it a night. He dumped Joe at his parent’s house and Cousin Tanja sacked out on our couch. The next day was 11am brunch at Casey’s Grandma and Grandpa Campbell’s house. Forgot the camera. They have a beautiful home and had the mountain of wedding gifts beside the pool so everyone had a good vantage point for watching the unwrapping. 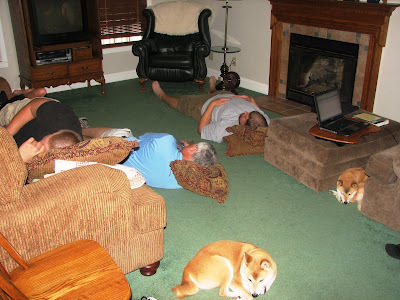 We left about 1:30 so the guys could get some recovery time before their trip home. so that Trev and Kyle could pack and head back to Charleston and Carlinville respectively. We had thought that Ken would have to drive Trev back but instead Erin's brother, BJ took a detour for us and went back to UofI, Champaign via Charleston --- thanks so much BJ!! Quite an eventful weekend, all in all!